Hello everyone, sorry for the big break in posting, I'm afraid the quiet period isn't over yet however. I'm about to go on holiday tomorrow, so I will be having a break from everything including blogging. I will try photograph any makeup looks I do but I probably won't be posting over the next week or so. Anyway, today I've got a quick comparison of a few similar colours that I've acquired recently. 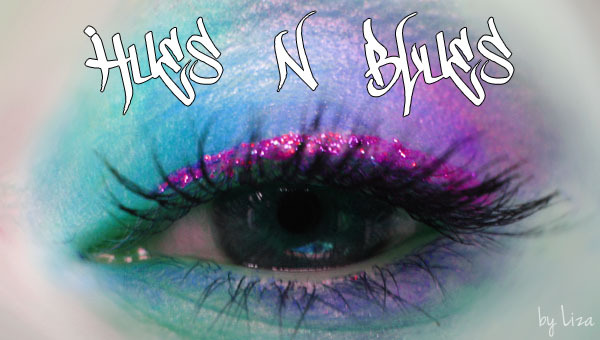 They are Detrivore's Crystalline eyeshadow, Detrivore Blue Hilite and Sugarpill Lumi. These colours are very sheer, so the swatches don't give that much away to be honest. You might be able to tell in the first picture that Lumi is a lot more on the green side than the other two. Crystalline is slightly more complex than Blue Hilite, which is just pure blue shimmer on a clear base. Lumi also has a lot more larger shimmer particles, whereas the other two are more of a sheen finish than sparkly. Over Pixie Epoxy, same order. Hope this comparison helps some of you! These are all really pretty shades! At first glance I thought they'd be very similar, but they're fairly different!